Thomas J Stanley discusses two types of wealthy people in his best selling book The Millionaire Mind. Those who are Income Statement Affluent and those who are Balance Sheet Affluent. Robert Kiyosaki also discusses a similar concept in his book Rich Dad’s Cash Flow Quadrant. Except, he divides people into four categories: Employees, Self-Employed, Business Owners, and Investors. To draw a comparison Employees and Self-Employed would fall under the Income Statement Affluent category, while Business Owners and Investors would fall under Balance Sheet Affluent. In this post we will discuss these two types of affluence, and why you want to become Balance Sheet Affluent if you’re looking to build long-term wealth. Stanley states “they have big incomes, big homes, big debt, but little net worth”. And that’s largely because they are addicted to credit. As their income increases so do their liabilities. A new raise means a they can afford bigger loan on a new car or home. If you looked closely at this group’s financial situation, they’re living pay check to pay check. And if their income were to dry up, they would be in trouble. Joe is an executive at a successful company and gets paid quite handsomely for his efforts. He has a luxurious house on the water, a Mercedes, a Land Rover, a boat, and a vacation home in Florida. Each of these items has a loan in one form or another. Not to mention his hefty credit card balances. After Joe is finished paying these loans and other living expenses each month he has almost no income left to spare. For that reason he puts almost no emphasis on saving for the future or investing. If he were to leave or lose his job today, he would have a difficult time making his monthly loan payments. Which could lead to the foreclosure or repossession of his homes and cars – or even worse, bankruptcy. The Balance Sheet Affluent often have substantial incomes, but with a high net worth. Their income is derived from assets and not by a career or profession like the employed or self-employed. They are typically business owners and investors. This group puts a greater emphasis on accumulating assets, and maintaining little to no amounts of consumer debt than the Income Affluent. And because they derive their income from their assets and have little debt, they are truly wealthy. If they were to stop working today, many could live many years off the income from their assets. Anna & Taylor are owners of numerous laundromats located in high traffic areas of the city. These laundromats have become abundantly profitable. And they have successfully systematized the business to the point where they no longer have to be involved in the day-to-day operations. They own used vehicles and live in a modest house in a nice neighborhood. They rarely use credit cards and have little to no consumer debt. Because of this they are able to save a large portion of their income to reinvest into their business and other assets such as real estate. In the next few years they will have accumulated enough assets to never work again. Left: Income Statement Affluent. Right: Balance Sheet Affluent. Anybody looking to build long-term wealth and financial independence should strive to become Balance Sheet Affluent. The goal is to have enough income-producing assets to cover your living expenses. Some people are entrepreneurs and build a business. They systematize their business to be automated and/or ran by their employees without the owner needing to be involved in the day to day activities. Their business becomes an asset on their balance sheet. Investors use their money to purchase assets such as real estate, stocks, bonds, and stakes in other people’s businesses. These assets produce income for them. In other words, they’re making their money work for them. Now not everyone is going to become an entrepreneur and start a business. 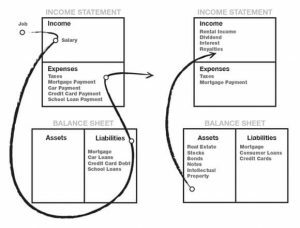 But if you’re already Income Statement Affluent, you are just a few steps away from becoming Balance Sheet Affluent. Instead of using your large income to buy a bigger house or nicer car using additional debt – start paying off your debt and saving your money to invest in assets. Over time you will accumulate enough assets and reduce your liabilities low enough to the point where you will be Balance Sheet Affluent. You’re a top selling real estate agent in your area and have a substantial income. You read a few personal finance books and decide you want to become Balance Sheet Affluent. But your saddled with a mortgage, car loans, and credit card debt like Joe from our previous example. You work with your advisors an develop a two part plan to become Balance Sheet Affluent. Phase I includes eliminating your consumer debt, which starts with paying of your high interest credit card balances and selling your luxury cars, paying off the associated loans, and buying a used car. By the end of Phase I you will have paid off much of your consumer debt, which frees up a large portion of your income to invest. In Phase II, you and your advisors set up a plan to build your balance sheet by investing in stocks, bonds, and real estate. It is determined that after 10 years of investing, you will have enough assets to cover your living expenses and will no longer after to work (if you don’t want too). If you’re looking to build long-term wealth, you need become Balance Sheet Affluent. This means you must acquire enough assets to at least cover your living expenses. To acquire these assets, you need to earn a substantial amount of income from a job, self-employment, or owning a highly profitable business. You must also live below your means and avoid accumulating large amounts of consumer debt, which soaks up your income. Instead, you must use your income to invest in assets that produce income and/or appreciate over time. Sign up to receive our FREE Multifamily eBook and newsletter!